Pittsburgh Mayor Bill Peduto today said that recent scandal and alleged cronyism at the city’s Bureau of Police may have it on the verge of another consent decree with the Justice Department. Pittsburgh, which has been without a permanent police chief since Nathan Harper was indicted in March 2013 on corruption charges, was the first U.S. city to agree to federal oversight after the Justice Department uncovered a “pattern and practice” of misconduct at the department in 1997. 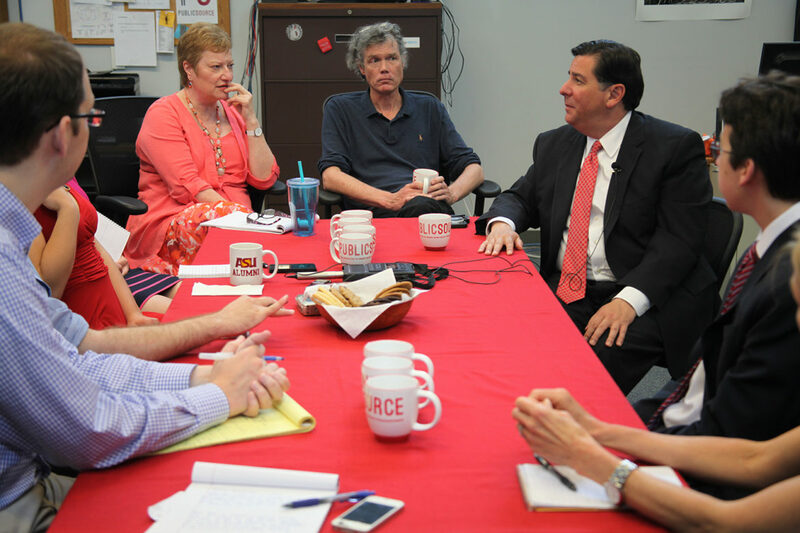 “[M]any of the officers who get concerned about when I talk about this don’t realize how close we are to going into another consent decree,” said Peduto, who visited the PublicSource newsroom today. The department has to heal internally and in its relations with the community, Peduto said, and move past the problems it has had for many years. He said he hopes to name a new police chief by Labor Day. The federal government has been investigating alleged corruption within the department. Peduto said that investigation could lead to intervention from the U.S. Attorney’s Office or FBI. “My goal is to not let that happen, to be able to solve our own problems,” Peduto said. He said he had been talking with U.S. Attorney David Hickton about the investigation. A representative for U.S. Attorney David Hickton declined to comment. A representative from the Justice Department in Washington, D.C., did not immediately respond to a request for comment. In February, Harper was sentenced to 18 months in federal prison for conspiring to create an unauthorized slush fund with city money. The former chief pleaded guilty after being accused of diverting more than $70,000 in public money to an unauthorized account. Harper, who was appointed by former Mayor Luke Ravenstahl, personally spent more than $30,000 of the money. Last week, a suspended police officer sued the city over allegations that she was retaliated against for opposing alleged corruption involving a valet parking company. The department has also come under fire from citizen groups after controversial incidents like the November 2012 shooting of Leon Ford during a traffic stop and the arrest of Jordan Miles, who was beaten by officers while walking to his grandmother’s house in Homewood in 2010. Police said they thought Miles had a gun and they reacted when he ran. Miles said the police failed to identify themselves and beat him while handcuffed. In March, a jury awarded Miles more than $119,000 on a false-arrest claim, but found that the officers did not use excessive force. Friction and distrust between the police and black community dates back to the 1960s, said a 2002 report by the Vera Institute of Justice. The department has also been criticized for its treatment of minority employees and the low number of minorities in the department. But the consent decree, which was lifted in 2002 after five years, was supposed to fix a pattern of cronyism, questionable force and strained racial relations between police and minorities. The department had been criticized for brutality, unwarranted stops and disrespect of citizens. The decree required the department to make reforms, including the establishment of an early warning system to keep track of problem officers. After taking office in January, Peduto said he planned to take a long time to hire a police chief and first wanted to have a new solicitor, head of the Office of Municipal Investigations and public-safety director in place. In May, Peduto announced the hiring of Stephen Bucar, a former FBI agent with experience in counterterrorism, as public-safety director, the last step before focusing on finding a new chief. Peduto said he wants a police chief who can solve the department’s problems and views the job as a positive opportunity. Should police officers involved in fatal shootings be identified? Philadelphia’s health department is serving up a dish of transparency. The federal government said it has no way of knowing the locations of all facilities in the U.S. that store ammonium nitrate, the chemical that blew up a West, Texas, plant last year, killing 15 people. Without improved monitoring of facilities that store ammonium nitrate and coordination between U.S. agencies, federal regulators “will not know the extent to which dangerous conditions at some facilities may continue to exist,” the Government Accountability Office report states.